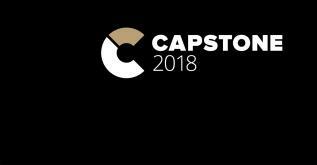 Held annually, Capstone showcases the breadth of skills and expertise students develop in the B.S. in Informatics, M.S. in Information Management and Master of Library and Information Science programs. Students create posters to demonstrate how they use technology, analysis and problem solving as tools to solve information problems for organizations and communities. Capstone project collaborators include organizations from the public, private and nonprofit sectors, and each project represents a concrete example of what it means to design and build novel applications of technology that meet the needs of people. A Tagboard of the social media activity surrounding Capstone captured the evening's excitement. You can also find more photos in our gallery on our Facebook page. Award winners received gifts from the iSchool and sponsoring organizations at the event. This year’s award sponsors included Accenture, BECU, ExtraHop, HERE Technologies, Microsoft, PwC, and Slalom. Le Button and Aydin Kwan, Best in Class award winners for Queer Comics Database. Social Impact Panel: Stacie Barnier, Director of User Experience, Pitchbook Data; Cheryl Scott, Senior Director of Business Analytics, HERE Technologies; and Jaime Snyder, Assistant Professor, UW iSchool. Commercial Potential Panel: Bob Boiko, Principal Lecturer, UW iSchool; Erik Johnson, Practice Director, Information Management & Analytics, Slalom Consulting; Ansel Santosa, Senior Software Engineer, Pioneer Square Labs. Research Panel: Clarita Lefthand-Begay, Assistant Professor, UW iSchool; Carole Palmer, Professor, Associate Dean for Research, UW iSchool; Jevin West, Assistant Professor, UW iSchool. Service Panel: Miranda Belarde-Lewis, Assistant Professor, UW iSchool; Kyle Welsh, Chief Information Security Officer, BECU; David Zager, Chief Design Officer, Pioneer Square Labs. Innovation/Design Panel: Joe Davey, Director, Technology and Advanced Analytics, West Monroe Partners; Ana Pinto da Silva, Principal UX Designer, Amazon; Jason Yip, Assistant Professor, UW iSchool. Diversity Panel: Hala Annabi, Associate Professor, UW iSchool; Araceli Lesko, Sr. Manager, Emerging Businesses, T-Mobile; Ravi Raghavan, Senior Director, Cyber Risk Advisory, Coalfire.